Isn't everyone across the board, and I mean everyone, talking about how sick and tired they are of the establishment? Yes, they are! Yet, this exhibits the media's willingness to stay persistent regardless of what the American people are really calling for. In other words, shove it down their throats until they accept that we (The establishment) are the ruling class, like it or not! This is becoming more apparent every day in this country. For example, the American people are led to believe that the Supreme Court can redefine God's definition of marriage (Genesis 2:24). 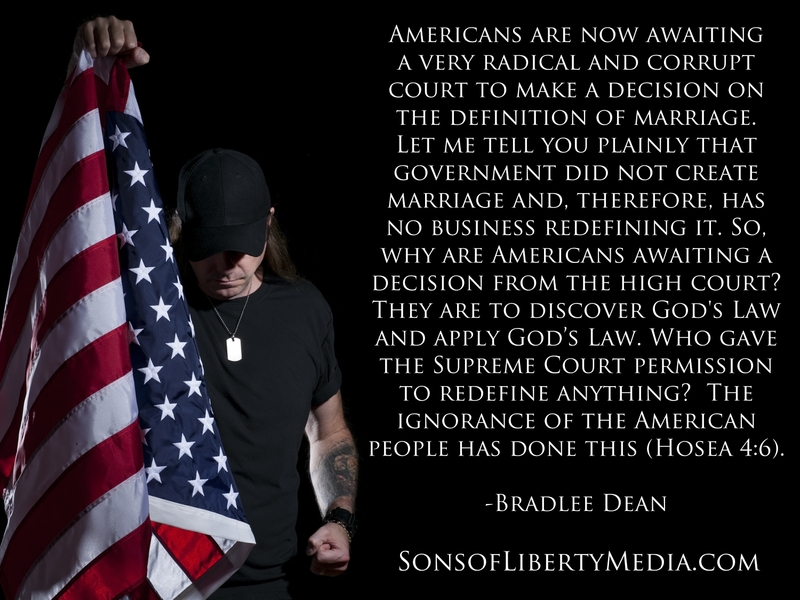 Americans are now awaiting a very radical and corrupt court to make a decision on the definition of marriage. Let me tell you plainly that government did not create marriage and, therefore, has no business redefining it. So, why are Americans awaiting a decision from the high court? They are to discover God's Law and apply God's Law. Who gave the Supreme Court permission to redefine anything? The ignorance of the American people has done this (Hosea 4:6).